There are many programs and initiatives carried out to help elephants thrive in a good environment.People who love animals always have a very soft spot in their heart for them. They look after them wherever they see an animal, whether if it’s their own or not, they take good care of them. There is one animal in particular that is loved and adored around the globe by everyone, Elephants. You would rarely find a person that would have hate in his or her heart for this animal. We at Elephant Conservation Program in India are here at your disposal to help you get to know more about these loving animals by getting you up and close to them and how they go about spending their day. Project Duration: Minimum 1 week stay up to 4 months. Coming for shorter period Join our 3 Days Elephants + Jaipur Tour Program. Project Fees: $400 for 1 week; $200 per week thereafter. No Application fees required. For more information about our fees please visit Volunteer Program Fees Page. Project Activities: Feeding the elephant, bathing them, Massage of elephant, cleaning the area, making bundles of hay & help mahout in making chapattis. Working Hours: Monday to Friday 3-4 hours per day. What is not included: Visa, Flights, Internet, Mineral Water Bottle, Monuments/Sightseeing Entry Fees, Telephone Calls, Insurance Cover, and Airport Drop off. Requirements: We don’t need any qualification for this project. Doing Voluntary Work India you must have lots of love & enthusiasm for the project. Visa Type: Tourist Visa. 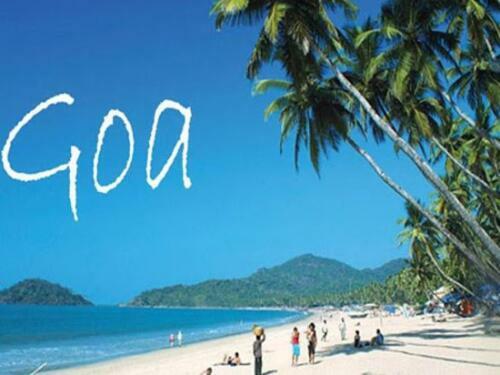 Coming for short period upto 30 days apply for On Arrival Visa by the India Visa Site. People who love animals always have a very soft spot in their heart for them. They look after them wherever they see an animal, whether if it’s their own or not, they take good care of them. There is one animal in particular that is loved and adored around the globe by everyone, Elephants. You would rarely find a person that would have hate in his or her heart for this animal. We at Elephant Conservation Program in India are here at your disposal to help you get to know more about these loving animals by getting you up and close to them and how they go about spending their day. We have variety of things up on the list that you can do with these wondrous animals. From giving them a bath to maintaining their feet to feeding them their favourite food, we let you do all sorts of enjoyable things with these animals. The work at Jaipur Elephant Project will require a minimum of one week stay which will last up to 4 months. Volunteers will be required to work 3-4 hours everyday on weekdays (Monday to Friday). Weekends will be off to work. On Weekends VWI organize Sightseeing Tours in Jaipur for Volunteers. Volunteers can join the project anytime of the year as per their convenience. This task requires no file full of degrees. All you need to have is dedication and a will to serve. If you have zeal to serve animals and looking for a way to do your bit, Volunteering with India offers you with the right opportunity. 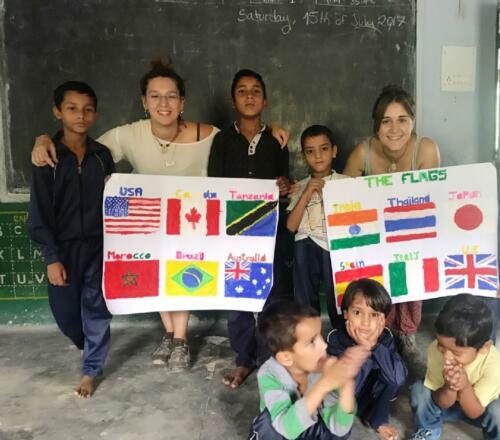 The purpose of many foreign tourists is not just to travel but also to volunteer in India for a number of social causes. Our Work With Elephants in India initiative gives you the opportunity to be a part of Elephant care program in Jaipur, the Heritage City of India. The Elephant village situated near Amber Fort is India’s first and world’s third village dedicated to Elephants. Stretched in an area of about 30 hectares, this village offers all the amenities, including a big lake, required for Elephants to thrive and enjoy themselves. Our program is directed towards helping mahouts in taking good care of these animals. The elephants in the village are the only source of earning for the poor mahouts, therefore their conservation and proper care makes the basis of their livelihood. The Elephant goes for the Tourist ride/safari in Amber Fort. By Looking at the bigger picture Elephants in India is part of the Hinduism religion as they are used for cultural festivals, family traditions and weddings. As per the number of total population of Elephants in city still 50% are not yet accommodated by Government due to the Elephant Village site is still under construction. As per our Program Volunteers can also be take part in caring for Elephants which have shelters out of the zone area. The volunteers will be required to carry out a number of tasks associated with proper caring of elephants including their bathing, food, cleaning, carrying water, massage and making hay bundles and chapattis. The volunteers joining the Work With Elephants in India program will be required to work for 3-4 hours. Working time can be changed according to work requirement. As you will start to work, you will surely become a part of the program and will not only learn a lot but will also get the satisfaction of serving animals and caring for them. 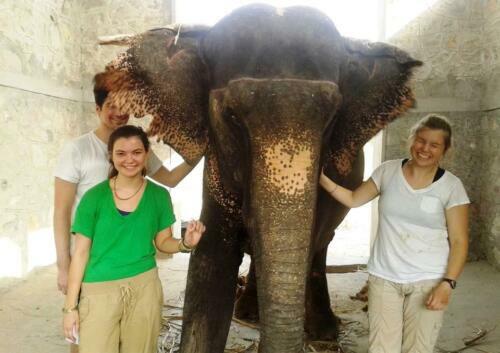 Being a volunteer will be a good opportunity not only to learn about elephant care but also to be a little close to Indian culture and traditions.Read Our –Volunteers Stories & Reviews about the Program. Why Should I join the VWI team and the VWI initiative? -It is an opportunity to work with an incredible team and satiate your desire to contribute a little to the animal care efforts. – A chance to know the city and its people well and work with them to get a better understanding of their tradition, culture, language and ways of life. – To get an experience of a lifetime which you can add as a badge in your resume. – If you love elephants, we provide you with a good platform to work towards their betterment. – You get a lifetime membership with us and you can also lend a helping hand by volunteering with our other ongoing projects. The Elephants in Jaipur are taking care by Government of Rajasthan, mahouts and their owners. Elephants are also used for the Tourism purpose, Cultural Events & Religious ceremonies in India from centuries. For the protection sometimes during the day you can find them in chained too. Before applying for the Program you must need to aware by the situation and agree by VWI Terms conditions policy. 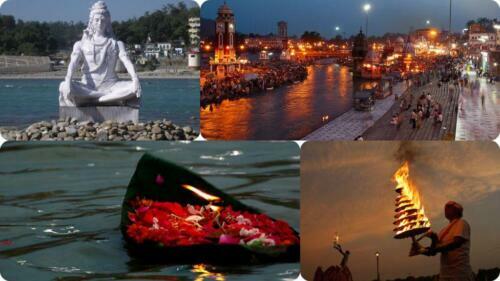 Arrival Day-:Volunteers will be picked from the arrival destination in Jaipur, India. After picking you once of our team member will bring you to the host family accommodation. There you will be detailed about the project and the working schedule, do’s and don’ts, that will work as a helpful guide to them throughout the project. They will also be introduced to the host family and all the facilities that they will be provided with for a comfortable stay. Day 2 to Working Days-:Volunteers will be taken to the project site situated near the Amber Fort to brief them about their daily tasks related to proper care of the elephants. The project coordinator and the mahouts will be there to guide them at every step. The tasks will remain same for the subsequent days. Weekends-:The weekends are free for you to relax and enjoy the Pink City of Jaipur. Every weekend we arrange sightseeing tour of Jaipur beautiful historical places, cultural places and programs with our VWI staff team. Volunteers have opportunity to meet with other volunteers also from other projects sites as everybody gets together on these days. 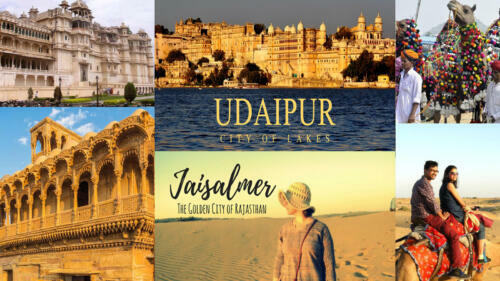 There are several other side trips that you can join which will greatly enhance your experience of Rajasthan, India. project. I had a tough start because there were some problems with my baggage in Delhi airport, But Sukret was very helpful through it all, so no matter what happens, just take it easy, and you are in safe hands. I will admit that I Had times when I just thought that everything was new for me here, it such a big culture difference. I come here for 4 weeks so on my beginning days I learned how to get around the city. The transportation is really cheap in India. I saw the entire tourist place on weekend sightseeing and did a lot of shopping. The staff members were really nice to introduce me for their families and taking me to different places. The work with elephants is amazing. On a normal day I got pick up from the host family at 5:00 a,m and was home again at about 8:30 a.m. Most of the days I cleaned the elephants area, washed and scrubbed the elephants and made food for them to eat. But I also experience to bath the elephant in the lake ride. Every day you have the program coordinator with you to the project, so you are never alone there is always someone to talk with and to answer your entire question. And that makes feel really safe and comfortable. I had an amazing time volunteering. Definitely a place I would love to visit again. Hard Work but really amazing elephants. All the people whom I met here is very welcoming and sweet. I like to give A Big 9 mark from 10 to VWI. The project Staff members Really great! Could not wished any better. It was great to write with Sukret, and he always answered really fast. I am really picky with food and I don’t like anything spicy, but the family was very nice to make sure there always something I could eat. My flight arrived early but within 5 minutes one of the VWI staff member was there to pick me up. Great Service. The accommodation was very good, the guesthouse had everything you could need including wifi internet, dry your clothes and a shop nearby that everything. The food was very tasty, available on demand and plenty of it – they were always offer more if it required. and I didn’t know where I was going but I always went somewhere exciting! I will miss our samosa parties in the tuk-tuk a lot. He was on time, his driving was great and his smiley hallo, good morning at 5:00 a.m was always much appreciated. Govind was my project supervisor and he really made my trip amazing. He was very helpful with any questions. I am yet to find one he couldn’t answer. He included me in things outside the project with his friends and family and I loved every minute of it. Sukret was also extremely helpful and answers my questions promptly. He was always around to check everything was ok. I would give VWI 10/10, I had an awesome time and want to thank everyone involved. I would highly recommend this company to future volunteers and will come back the next time I am in India. I did the elephant project for 3 weeks. Everyday we left at 5:00 a.m and started by cleaning the elephant enclosure picking up her poo with your bare hands , washing and scrubbing the elephant, then dressing the elephant ready to go to amber fort. Once the elephants had left we made bundles of food for them to eat later. Some afternoons we would make chappathi’s for elephants. The mahouts were great fun and always got involved with whatever they were doing, and the elephants were amazing. I was bit nervous about going to India with VWI, but there was absolutely no need to be. The staff at VWI was professional, friendly and couldn’t have been more accommodating. 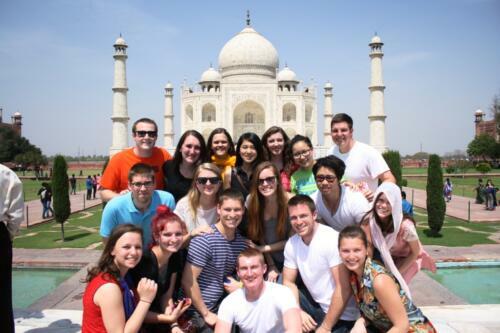 They were very inclusive and I really enjoyed getting involved and learning about India culture firsthand. I was treated so well – I loved meeting the families and their friends. My sari will remind me of all the great times I spent with them. The project itself was really enjoyable with a highlight being washing the elephant in the elephant pool on my last morning. 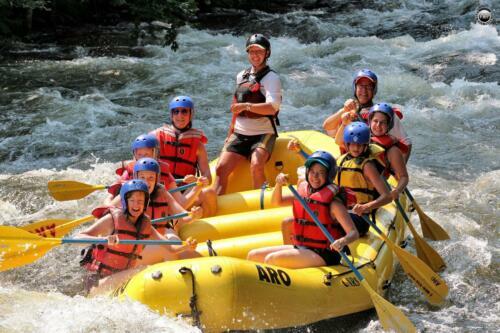 The sightseeing trips on the weekends were very well organized and included everything. Jaipur is a wonderful city to live in. I got to experience all the projects offered by VWI; this organization does a wonderful job. All projects are well-run and because all transportation food and accommodation is organized for you, all you have to do is enjoy every minute of the experience, the end of my time in India came a bit too fast. transported to guest house. The Host family was very welcoming and humble. The food was very nice, the family were happy to serve more if wanted. The transport to the project everyday was prompt and reliable with the driver being very friendly. The project staff very friendly and welcoming; each member was very helpful in all areas, making the trip in India a lot more enjoyable. I like to give 10 out 10 marks. The elephant project gave a great insight to the different lives people lead. Working with the elephants was enjoyable. They were very sweet and the workers were friendly. I would love to return to take part in the project. Gail: – It was so nice to find someone waiting for us when we walked out of the airport with our names on a card. It eliminates any worries. Our Host family was lovely and getting to know them was a special part of our stay. The food was tasty. Our Tuk-Tuk ride gave us a chance to see the city waking up in the morning – sights we could not have ever seen. The driver was always prompt with a smile on his face. The Project staff members were great! It was a secure feeling having someone with it while we were working to explain + interpret things. We decided to Volunteer with VWI to be part of the country. Not to just be a tourist. We picked the elephant project because we love animals. I Would like to give full 10 out of 10. Stanley:- Our arrival pickup service was great! Accommodation and food was so nice. They did a Good Job Accommodating my special diet. Family was very helpful. Our Driver was great and always on time. The Project Staff members were very helpful and friendly. We decided to go with VWI as it’s sounded a good organization have good programs. I would like to give 10 out of 10+++. This experience is for a lifetime! I would recommend this program to everyone. Brenda:- Excellent pickup service. Host family is lovely and food was very good. Our transportation service was excellent. The project staff members were very friendly. I decide to join the program as my friend Gail recommends me to do it. I would also like to give 10 out 10. Very interesting and rewarding to be able to see and share the care of the elephants with the hard working mahouts. The Project Coordinator Mr. Raj Soni was very attentive and was very concerned that we were well taken care of. It was a pleasure working with this company and yes, I would recommend this program to everyone. little bit irregular of our food for couple of days. Our transportation service was good. The taxi driver was so kind and took great care of us. Our Program Coordinator was great. Good English and always happy face. I decide to volunteer to Volunteer with VWI the reason was I wanted to work with elephants in India and found website online. The information on website was good. It seemed like a well organized organization and I like volunteering. Other Volunteers had also written great things about the project. I would like to give 10 out 9 marks to VWI. I less 1 marks because our breakfast was irregular for 2 days . Our Project life was good. We got up at 4:30 in the morning to get dressed and met the driver at 5:00 a.m then we drove to the elephant village. The first meeting with the elephants was exciting. They were sleeping when we arrived and laying down. When they got up we realized how big they are! Magnificent creatures. They have the kindest eyes and are almost like people. They understand what you say them. After having sorted out sugarcane and cleaned their areas we wash them. Then they go to the fort and we drink chai . We reached home at around 9 a.m. Breakfast at 9:15. Then you have whole day yourself. Lunch at around 13:00. Dinner at around 20:00. Two days a week you go back to the elephants at 13:00 to make food and chapattis for them. All the mahouts are funny, loud and few speak English but our program coordinator is there helping out. In the weekends You get to go sightseeing the city palace, monkey temple, forts etc.. The other volunteers become your best friends and there is a great feeling at home! I could really recommend the project, but be sure to stay longer than 1 week; it is not enough time to spend with these awesome animals. Elise :- We driven to the VWI office by our own driver. Then pick up by one of the team member in VWI. During the week our taxi driver totoram was always on time. The food was good and the host family was very nice. Our Project staff members were very helpful. No complains. I decide to volunteer as the reason I wanted to go to India and I wanted to work with and get to know the beautiful elephants. I give 10 out of 8 Marks to VWI. This is your choice to experience India from Inside the ways of an Indian Family. While you contribute to the Indian Society and make new friends from all over the world. The Indian People i met were very friendly and helped me all the time. The work with Elephants is hard but the elephants such amazing animals. I would like to come again to do this project. They will stay always in my heart. VWI is the best volunteering organization in India. I would like to give them A+ grade in all their services – Airport Arrival Pick up Transfer, Accommodation & Food, Transportation, Project and staff members. They showed me Jaipur Sightseeing and by volunteering with them help me to learn about the Indian people, history and culture. I really enjoyed the experience, would like a bit more time with them. Mahouts are very friendly, our program coordinator was a star and totaram ji ( taxi driver ) was great. 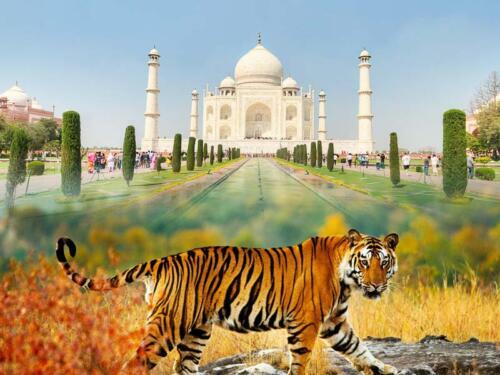 I was in project for 3 weeks; on weekends I had visited Sightseeing’s of Jaipur, Agra & Ranthambore Tiger Safari. 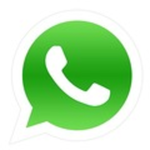 VWI arrange fantastic services. Loved last day with tigers. Thank you Sukret. Higly recommend the project. We are husband & Wife. Both of us really enjoyed the project it was great to work with elephants. Feeding them, clean up their living area, help the mahouts in their daily work- everything was fantastic & a great experience for how to care these big elephants. The host family house is an excellent location and the family was very welcoming and helpful. When we told them our bad was too hard they found another for us. Everybody on project is very much looking after us and very kind. Really back again with our kids next summers. Very nice and interesting experience with nice and welcoming people and of course with beautiful elephants! The reasons to choose VWI is I wanted to do an elephant project while I was travelling in India and I found this one on internet.. It seems good, trustful and with a good location. Jaipur is beautiful city to visit in the afternoon and on weekends. The pick service was in time, accommodation was perfect – very nice room and food was good. The project staff members were very nice and Kind. I would like to give VWI 10 out 8 from my overall experience. The family house that I stayed in was lovely, and all the family were welcoming to me, before I aimed at the project, all my emails were answered very quickly and professionally. During my stay both program coordinator and tuk-tuk driver were very friendly and helpful, and visiting their houses was a great experience, so thank you to them for their hospitality. However I was rather disappointed in starting days as I had to woke early in morning but after few days it been in my habbit as I understood the care works needs from morning hours when elephant woke. I everyday work from morning 5 a.m to 9 a.m. I also come in afternoon hours twice a week when we make chapati’s for elephants. I have took care of 5 elephants and really want to bring all of them to my home. Really sad that my project finish needs to go home for study again. Will come definitely next time. The children project I visited, only for 2 days on the other hand was great and I felt I was contributing to something, so I would recommend all the projects which VWI offer. Working with the mahouts was a wonderful experience. Setting to know the elephants was an experience that cannot be explained. No regrets, I hope to volunteer with VWI again. I believe I have new friends and hope to see them again. I would like to give Volunteering With India 10 out 9 from my overall experience. Toto the once of our taxi driver was the best driver for transportation, he makes fun – laugh and always in time. The project staff members, accommodation and food was excellent. I definitely recommend the project to other volunteers. This project is a nice experience and a nice way to learn about india. The arrival pick up services was perfect. Accommodation , Transportation and staff members were great. 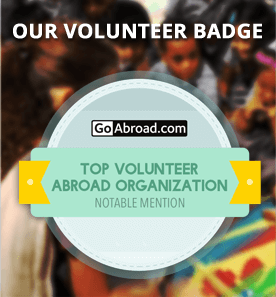 The reason to volunteer with VWI – The price was best compare to other volunteering organization abroad and in India. I would give 10 out of 10 from overall experience. I really enjoyed the project. My Project life is to travel to keep learning everything I can so I would say to everyone do not expect anything just learn everything you can about everything that comes. I would like to give 10 out 9 Marks to VWI. I wanted to do Elephant Care as I am waiting to do this from long time in my life. I search over internet many organization and projects which offer Elephant Volunteering but VWI was the best in selection of all these as they have very flexible services and by working you can direct have hands on Experience with Elephants. The Project Transportation, Weekend Sightseeing, Staff Members; everyone was perfect. Really looking to come back again with my friends and family. elephants, clean them out, give them good massage, scrub their body with brush, making the bundles of hay for them to eat. The elephant village is so huge & really been adorable to see lots of elephants in groups & when they make fun in the lake. The village really needs volunteers to be giving the care to elephants & help the mahouts for their hard work as there is lack of people to support them. Well on the project i am staying with one more volunteer in an Indian host family which really been helpful for us to get to know about the Indian life & culture. The food which we eat is so delicious. Our Indian mother is such a nice cook, everyday she makes new Indian dishes for us to eat & she has taught me few dishes to prepare during my stay. It’s really been great to interact with Indian family. 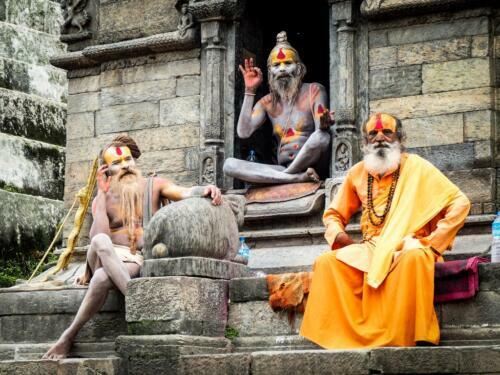 Indian culture is so different from U.K it’s really been good to learn about different aspects like religion, the festivals of here, the traditional things, clothes of man & women and other things which people normally do in their daily living. Here are so many things which u can take in your camera, to write in your blogs & make memories for your lifetime. I must say in the end to the people to be work with the elephants as these animals are also part of our life. Our host family was wonderful. We are served with nice Indian food and good Indian accommodation facility. Transportation service was good. The taxi driver was very lovely person. Project staff members very good. I decided to volunteer with VWI because I wanted to spend some time with elephants, be of service in some way while in India. I would like to give 10 out of 8 mark to the organization. I think these projects are very good ones to westerners with various aspects of India/Jaipur also. I hope we were helpful to the projects/ People and Elephants. Our Pick up service was fine. Accommodation and food was good. Enjoyed riding in Tuk-Tuk for everyday project transportation. Project staff members were fine, tried hard to support me. 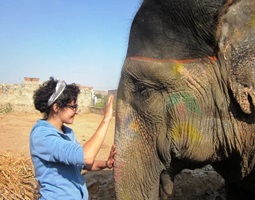 I decided to volunteer with VWI because I wanted to do something while in India and Love Elephants. I would like to give 10 out of 8 to VWI. The VWI project is a good partnership between volunteers and places that need help. I learned a lot about India – the people and the animals. Rita:- The Project itself was very enjoyable. It was cool to get to know the elephant. The work was not too challenging. The Mahouts were friendly and joking with us. Raj the project coordinator was pleasant to have with us. Govind and Sukret were very accommodating too. Totoram the driver was kind and caring and we enjoyed his presence. Nina:- Project was good, all mahouts that I worked with were friendly and tried to talk to me even limited English. Elephant work was good. It was good to be up close and personal with the elephants. All were well trained and I felt 100% safe when working closely with them. The Transport was reliable, on time and friendly. Project coordinator Raj was great to show us around and answer our question about elephants, the project, Indian culture. His English is really good which enabled us to communicate with him and the mahouts. Project was great, everything associated with the elephants was amazing, such a great experience. Justine:-The elephant project is incredible! The mahouts were very friendly and obviously we devoted to their elephants. Being able to wash and bathe the elephants was a highlight! The Project coordinator was amazing , very helpful and lovely to talk to. Totoram was the best driver. He was so friendly and accommodating & took us every morning for chai! The arrival pick up service was very good. The host family and food was fine. The transportation service was very good, it comes in time and take us where we need to go. The Project staff members were very good and helpful. I decided to volunteer with VWI as I liked the details on the website and wanted to experience REAL India and work with the elephants. I would like to give 10 out of 10 marks to VWI. I have really enjoyed the experience and would recommend to anyone who wants to have a real experience. The Elephants were fantastic, hard work but worth it! The arrival pick up service was very good. Accommodation and food was good. Transportation service was very good and always on time. All the project staff members were very helpful. I would like to give 8.5 mark to VWI. Getting up early wasn’t pleasant but was worth it once we got to the elephants. I enjoyed the time a lot. Arrival was fine. Some confusion over Bus drops off point. Bus problem was due to misinformation from private bus company. Accomodation was clean and good. Food was good. Transportation service was excellent. We needed additional transport after project which was available upon request. The Staff members Sukret + Govind were both Excellent, V.Helpful and informative. I like to give 10 out of 9 for my overall experience and satisfaction. We have Found Work Enjoyable, Giving us Excellent Insight. The working life of a mahout and the day care of the elephants was good. We enjoyed the opportunities to bath the elephants. All the mahouts were very friendly and helpful. Pick up service was excellent. One of the VWI team member was there to meet me with a big smile. The host family made me feel like the part of their family. Welcoming helpful and been to please. Transportation service was very good. Toto who drove me is a very personable chap and one felt confident with him driving in Jaipurs Chaotic streets. Definetly recommend volunteers in the project to care ele! The Arrival pick up service was Great! Govind found me at the train station when I arrived at 5 a.m. The accommodation and food in Host Family was Fanatstic. The family was very wonderful. Transportation was great as well very friendly driver. Everybody I met at the project & staff members were generous and helpful. I decided to volunteer with VWI as I was teaching already in Jaisalmer, India for 2 months. I wanted to volunteer with elephants on my way back to the states. So happy I did. I would like to give 10 out of 10 to VWI for my overall experience & Satisfaction. A message for future volunteers – Everybody should do it! No need for sightseeing on the weekends though. I think the real India, the authentic experience is much better than to visit forts, palaces etc.. Thank You!!!! The arrival pick up service was very good, on time and comfortable. Food was great, accommodation clean and proper. The transportation service was Excellent, Best driver ever! The project staff members were also excellent. Very nice of them to bring us to their home. Feel very welcome, everyone was very friendly and helpful. I would like to give 10 out of 8 to VWI for my overall experience & satisfaction. A message to future volunteers – You will have a great time at the Elephant Project. It’s amazing to be a part of taking care of the animals and the staff of Volunteering With India does everything they can for you to have everything you need. From early morning chais to weekend entertainment. I loved the elephants and the people in Jaipur and I am gonna miss them both. It was good, was a little lost but sukret found me. Had a comfortable journey and he went out of his way to find a exchange place for my money. Rooms were great and food was lovely. Totoram our driver was lovely I enjoyed our tuk tuk journeys very much. He is great person. Our project coordinator was great very welcoming, very chatty and his family was lovely. I would like to give 10 out of 8 to VWI. I had a great time being so close with the elephants. It’s a really interesting experience. The arrival pick up service was very efficient – no problem. Accommodation, Food & Host family all were good, clean rooms, food was fulfilling, family was very helpful. The project staff members were helpful. Would like to give 10 out 8 for my overall experience and satisfaction. Very comforting to know when travelling to a foreign country alone for the first time someone will be there to pick you up. Also people will be there at the family guest house to help you find things, translate and make recommendations. The volunteer experience was fun, timely and safe and although things don’t always go as planned, the staff are very accommodating to each person needs and to provide each person with a beneficial, memorable experience. We picked up last minute because our tour driver pulled out-good service. The accommodation, food and host family was excellent. I can’t take spice so these were perfect. The host family were so welcoming. The transportation service – couldn’t fault it-very safe driver. Project staff members were really nice- chai on tap, they made us laugh a lot. I would like to give 10 out of 9 for my overall satisfaction and experience. The 4:30 a.m starts are a bit of a struggle but after a windy tuk-tuk ride you are wide awake! After a day or two of scrubbing and sweeping. I have to say it can be hard work, but I am so thankful to volunteer with India for giving me the opportunity to work with these amazing creatures-they all have their own personalities and you can help a lot. My faourite elephant name was Kajal. A really cool programme, You see first hand how the mahouts care for their elephants. Loved it! We picked up up from our hotel, took us straight to the elephants, it was very easy and helpful. The host family were absolutely lovely, really friendly & helpful. I felt at home. The food we had was the best curry I’d had so far. Our tuk-tuk driver was very very nice and caring, he even helped megan clean coffee on new top after she tipped it over herself. The project staff members were super friendly & nice. They speak quite good English. Able to answer any questions we had about the elephants. I would like to give 9 out of 10 for my overall experience and satisfaction. I really recommend joining this project. It’s really good value for money and you get a very good portrayal of what it’s like to be a mahout. It’s a really early start but it is worth it to work with elephants & they give you loads of chai. My only regret is not being able to stay another week! The arrival pick up service was very good, efficient & friendly. The accommodation & food was good, the host family was wonderful, kind and always ready to help. The transportation service was very accommodating. The project staff members were very helpful. I was very happy to be able to work so closely with the elephants and get a more realistic and authentic experience. Working with Elephants is hard work but when you got to sit on top of one, it’s very rewarding. I loved the week that I spent here in Jaipur. The accommodation & food was Great! I loved the host family. The transportation service was good, we always arrived safely. The Mahouts were always very friendly + willing to let us try whatever we wanted. I loved them. I would like to give 10 out of 9 to Volunteering With India for my overall Experience & Satisfaction. Able to get great bonding experiences with the elephants as a appreciation for the hard-working Mahouts. The host family is amazing, and they are excellent chefs. The transportation service and the project staff members all were great. I would like to give 10 out of 9.5 to Volunteering With India for my overall experience & Satisfaction. The arrival pick up service was very good. The accommodation and food was very good. The family was welcoming and helpful. The food was tasty and plentiful. Very good transportation service; toto tuk-tuk driver safe and always on time. The project staff members were very attentive. I would like to give 10 out of 9 to VWI for my overall experience and satisfaction. I had an enjoyable and rewarding experience with the elephants and children and enjoyed seeing the sights of Jaipur. I felt welcome and taken care of. I highly recommend Volunteering with this company. The arrival pick up service was amazing, I arrived to be greeted by VWI coordinator holding a sign with my name. Accomodation was allright. The transportation service was absolutely amazing. The tuk-tuk driver was on time, patient and very well mannered. The Project staff members were Great! Very helpful knowledgeable. Was taken to see a Bollywood film which was a lot of fun. Nice to have the project manager with us at all time of work. I would like to give 10 out of 7 for my overall experience & Satisfaction. The Elephant Project in Jaipur was amazing experience. I learnt a lot about Indian culture by living with a traditional Indian Host Family. Once there, you get thurst into work at the elephant village and it is very surveal to be working with such big gentle giants. I would recommend this without a doubt to anybody who is thinking about doing this. The Arrival service was absolutely fine. Was on time to a pleasant journey. Host family were lovely. Accommodation was great and the food was tasty. The driver was really nice + helpful. Transportation service was fine. The project staff members were approachable + helpful. I decided to volunteer with VWI as I wanted to work with elephants and for it to be flexible 1 Week Experience. VWI was able to accommodate this. I would like to give 10 out 9 for my overall experience & satisfaction. The project was a great experience and I will remember forever the wonderful people I met along the way. Everyone was extremely friendly + welcoming. 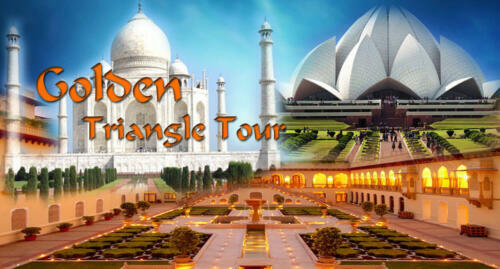 It was great that the program includes a 2 day Jaipur tour and is flexible to your needs. I will really miss it. I wanted to work with elephants since I was 3 years old. Found VWI on internet and decided to give it a go. This program is very good to get interact into giving everyday care to the Elephants and their mahouts. The Host family were very friendly + welcoming felt like a guest not paying customer. Meals were tasty. The staff members are friendly and welcoming. Good English spoken. Definetly recommend to future volunteers. The reason to decide volunteer with VWI is – Seemed like a great way to be exposed to families and experiences beyond the usual “tourist options”. Loved the idea of working with such wonderful animals. A unique opportunity! Would like to give 10 out 8 for my overall experience & satisfaction. This experience is absolutely like no other. If you want to experience all taste of the “real India this is the place to be. Your presence will be appreciated and give you experiences you will never forget. The host family was extremely gracious, friendly and helpful; room was okay; food was absolutely delicious. The project staff members are very friendly and tried their best to make us feel comfortable. Very attentive, professional & Friendly.